Luke Cage exists in a world all its own: Harlem, a place where art, culture, and families still thrive despite constant violence between organised criminals and police rages in the streets. In its second season, Harlem isn’t just home for Luke, it’s part of his larger destiny to become a hero. Luke Cage’s second season picks up after the events of The Defenders and while everyone—Luke, Misty, Claire, Colleen, and yes, Danny — still has fresh wounds, they’re on the mend and trying to define what getting back to a “normal” life means. Luke Cage’s ensemble cast is even larger this go around and it works in the show’s favor, given that the season spends a lot of time unpacking the idea of monolithic communities. On the heroic side of things, Luke’s enjoying his newfound status as a bonafide neighbourhood hero who everyday people love to stop and take excited selfies with — a dynamic that brings out a welcome brightness in Mike Colter’s performance. Luke’s fame is a double-edged sword, though. For all low-level crimes that Luke deters with his presence in Harlem, more serious criminals see him as a target worth taking down, if only for the glory of it. Of course, most of the attempts on Luke’s life end up badly for his enemies. But as the season opens and he begins to see things like his name being used to sell heroin, he begins to wonder, as all heroes do, whether he’s a lightning rod endangering the people he wants to protect. Luckily, Misty Knight (Simone Missick) is always there to (much more adeptly) handle the threats that Luke doesn’t quite know how to or those her fellow officers refuse to engage with. But when we catch up with Misty, she’s in a dark place, both because of what happened during The Defenders and because of her guilt and anger over all of the criminals set free because her former partner Scarfe was a crooked cop. The loss of her arm brings out a vulnerability in Misty that, for a while, drags her down and brings out her self-doubt, but also gives her some much-needed time training and bonding with Colleen Wing (Jessica Henwick), which quickly brings her out of her funk and lays the groundwork for something more. Since the moment that Misty stepped into frame and started stealing scenes left and right, two of the biggest questions on everyone’s minds were: 1) When’s she gonna lose her arm? (a famous part of her comic book counterpart’s story) and 2) What’s it going to be like when she gets the bionic one? Because Netflix’s corner of the Marvel Cinematic Universe is quite a bit more grounded than the rest, the prosthetic that Misty ends up with isn’t exactly the vibranium-constructed technological marvel it is in the comics. Instead, it’s a more realistic, cutting-edge prosthesis that really helps Misty feel whole again and puts her back in a position to hit the streets. For all the work Luke Cage’s heroes do to keep Harlem safe, the devil works through Mariah Dillard (Alfre Woodard) and Shades (Theo Rossi) to keep it vulnerable. As the reigning queen at Harlem Paradise, Mariah still has her sights set on building a legacy and reputation as a force for good regardless of the things she’s willing to do to achieve her goals. For his part, Shades is still loyal, but beginning to question Mariah’s business acumen—something that causes moments of friction and warped anger between them in fascinating, dysfunctional ways. Alfre Woodard as Mariah Dillard and Mustafa Shakir as Bushmaster. 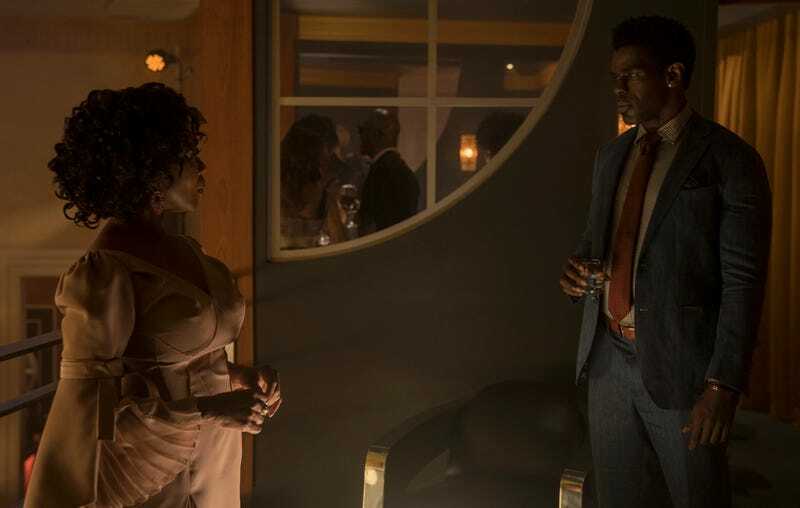 Broken into its constituent parts, Luke Cage’s narrative elements are all fantastic in theory and in many cases, the season’s stories weave together wonderfully. The time Misty spends with Colleen is meaningful and will make you wonder if and when we’re ever getting a Daughters of the Dragon spinoff. Surprisingly, Shades’ subplot with Comanche (Thomas Q. Jones) is much more emotionally complicated and heartbreaking than you’d expect. But for all of those excellent smaller arcs, there’s a lot more of Luke’s comparatively less interesting stuff to take in. As cool as it is to see Luke and Bushmaster fight, there’s nothing really compelling about their being adversaries. Bushmaster’s a bad guy and Luke punches bad guys and... well, that’s it. A significant portion of the season is dedicated to Luke gradually beginning to speak to his estranged father James (portrayed by the late Reg E. Cathey), a preacher with ambivalent feelings about his son being a vigilante. The scenes between Luke and James are solid and at times moving, but as the season goes on, they all begin to blend together and feel like they’re just stretching the show out. As is the case with all of Netflix’s superhero shows, Luke Cage is too damned long. We all love seeing superheroes going through it, but 13 hour-long episodes is a huge commitment of time for a story that definitely didn’t need to be that long. But, to play devil’s advocate, Luke Cage has always had a distinct rhythm and pace to it that’s meant to make you sit with it for a while to take it in. Maybe that’s the key. Even though you can binge Luke Cage when it drops on June 22, it’s probably best that you don’t. Rather, pace yourself, settle in for an interesting, if sprawling soap opera of a story, and contemplate whether you honestly believe Luke and Danny would ever get along.